Weddings are a big part of what I do. I routinely dedicate a good part of my schedule to preparing music, planning set-lists, arranging new music, recording demos, rehearsing with other musicians, and working out timelines and logistics. I also take special care in communicating with couples, planners, and venues making sure that everything will be just right for the big day. Over the years, I have played more weddings than I can count! I've learned a tremendous amount about what goes into making the day a success. I understand the process and the kind of detail oriented work that contributes to that success. I also know that though I may perform at dozens of weddings every year, my clients only get married once. With that in mind, I approach each wedding with a fresh mind and work with the couple to create an occasion that is specially designed for them. Drawing from my experience and listening to each client's unique interests, I'm happy to walk through all the steps and answer any questions and put in the time that is due to such a momentous milestone. Please scroll down to look at offerings and services for weddings. Don't hesitate to contact if you have any questions or would like more detail! I have played music at all kinds of wedding events and I have found that live music always adds a little something to the occasion to help make it special and exciting. It gives it a mood or atmosphere that makes momentous occasions memorable and unique. Let me know if you had any ideas or had a vision for something unique! Making sure everything is heard is a must. This goes for the guitar as well as speaking. I have been to many weddings where the officiant is impossible to hear or speeches get muffled and lost in the breeze. Impact and presence make a huge difference in the experience of guests and couples alike. Sound reinforcement, although behind the scenes (when done well), is crucial. With this in mind, I started taking matters into my own hands, providing mics and sound for ceremonies and cocktail hours. I'm also pleased to offer a complete sound-system for cocktail hours or receptions. I will be there to set-things up and make sure they are running smoothly and also to take everything down at the end of the evening. This is great if you were looking to use an ipod or computer to play music during your cocktail hour, dinner, or reception. A special occasion deserves special music! I am pleased to offer customized arrangements and song requests to add a personal touch to your big day. I can adapt music from many genres and styles for the solo guitar or a small ensemble. I've done everything from classical repertoire to old country songs to current pop tunes! The guitar is the perfect instrument for transcribing music. It is able to convey the melody and supportive harmonies and bass-lines all the while, lending it's own uniquely intimate character to the music. Over the years, many of my arrangements have made their way into my standard rotation of repertoire. You can listen to many of them in the listen section of this site. When time permits, I try to record new arrangements and send them to my clients as a preview or sample. That way they know exactly what they're getting into! But, they can also make suggestions or revise their choice if they weren't totally pleased. If you had an idea for a song please feel to run it by me and I'll let you know how it might translate in an arrangement! 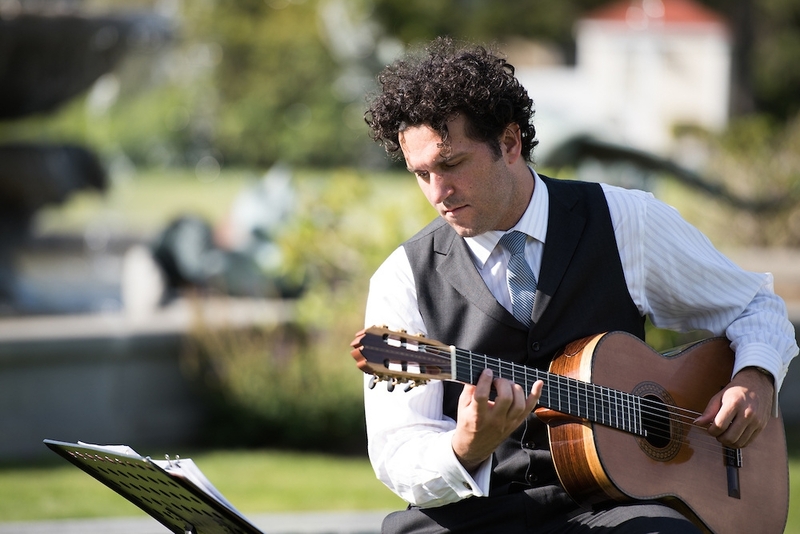 The addition of extra musicians is a great way to inject life and energy into your wedding music. Guitar/violin or guitar/flute adds a certain elegance to a ceremony while guitar/piano or guitar/vocals can add a definite energy to the cocktail hour. I've worked with many musicians and all kinds of instruments. If you had an idea or would like some suggestions for possible duos or trios please send me a message via contact. 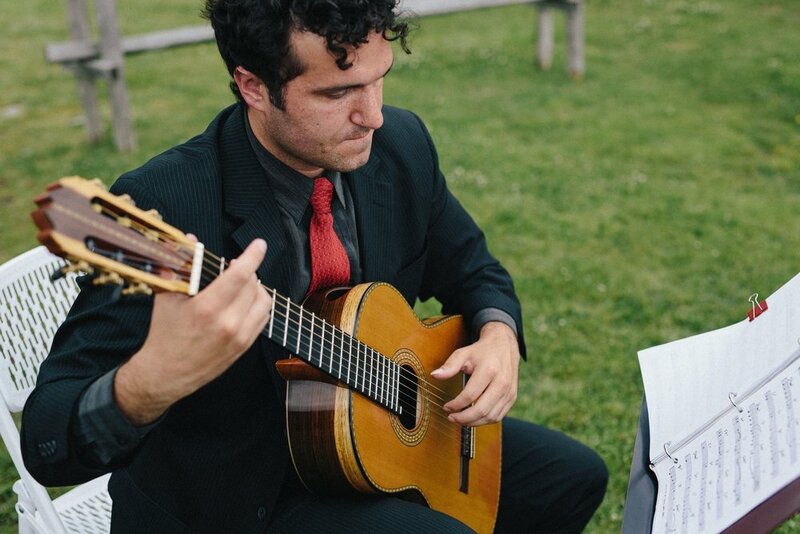 One of my favorite set-ups is to have solo guitar for the pre-ceremony/ceremony music and then move to a jazz/latin duo or trio for the cocktail hour. This provides the best of both worlds, an elegant, contemplative ceremony with the extra energy of the duo during the cocktail hour as your guests start to mingle and unwind.